The German Grid projects in the fields of medicine, medical research and life sciences collaborate in the TMF 'Grid forum'. Together, the projects in this forum serve to enhance national cooperation with D-Grid as well as international cooperation with the HealthGrid at European level and caBIG in the US. The Grid forum was established in January 2008 as part of a joint workshop involving TMF and the biomedical Grid projects (MediGrid, Services@MediGrid, MedInfoGrid) together with representatives from caBIG (US) and D-Grid. 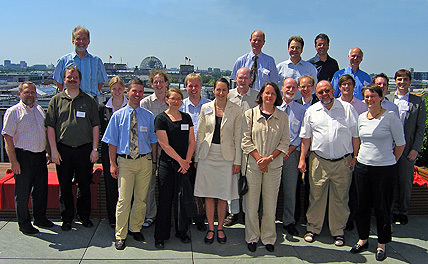 TMF news "caBIG and TMF workshop in Berlin on January 24, 2008"
Back row, l.t.r. : Prof. Dr. O. Rienhoff (Uni Göttingen), Prof. Dr. U. Schwiegelshohn (D-GRiD), S. C. Semler (TMF), Prof. Dr. M. Hofmann-Apitius (Fraunhofer SCAI), Prof. Dr. T.Penzel (Charité); Front row: Prof. Dr. Dr. J. Bernarding (Uni Magdeburg), Dr. T. Steinke (ZIB), S. Metz (c.a.r.u.s. HMS) , Prof. Dr. U. Sax (Uni Göttingen), Dr. R. Müller-Pfefferkorn (TU Dresden), Dr. D. Krefting (Charité), Dr. S. Canisius (Univ. Marburg), Dipl.-Inf. S. Scherer (Fraunhofer IWU), Dr. K. Stroetmann (empirica), Dr. A. Weisbecker (Fraunhofer IAO), K.-P. Mickel (Karlsruher Institut für Technologie), Dr. M. Huber (Siemens), M. Blaurock (TMF), S. Scholz (TMF), Dr. A. Pollex-Krüger (TMF), Dr. S. Rüping (Fraunhofer IAIS), A. Dobrev (empirica). The Grid forum was formed in a corporate workshop of the TMF and biomedical Grid-projects on January 22/23, 2008 in Berlin. L.t.r. : M. Rath (Services@MediGRID), O. Rienhoff (MediGRID), C. Ohmann (KKS Düsseldorf), S. Scholz (MediGRID), M. Hartung (MediGRID), F. Dickmann (KN AHF), E. Rahm (MediGRID), S. Canisius (MediGRID), S.C. Semler (TMF), T. Penzel (MediGRID), B. Beck (Fox Chase Cancer Center, Philadephia / caBIG), M. Goller (Projekt-träger DLR), U. Schwiegelshohn (D-Grid), D. Krefting (MediGRID), H. Roosendaal (Univ. Twente/NL), R. Speer (IMISE/ KSL), T. Lingner (MediGRID), J. Hampe (MediGRID), T. Steinke (MediGRID), K. Peter (KN Hepatitis). Es fehlen: A. Pfeufer (KN Vorhofflimmern) und M. Blaurock (TMF).